The Hiddenite Arts & Heritage Center is a non-profit organization, located in the Hiddenite community of Alexander County, serving the people of Northwest North Carolina by providing quality arts and cultural heritage programming that is accessible for all. Founded as The Hiddenite Center by the late Eileen Lackey Sharpe and R.Y. Sharpe in May of 1981, the Center has made a profound impact in the region, inspiring generations of artists by providing opportunities to develop, express, and share creative talents. In its third decade, the Center continues to grow and thrive, adopting an enhanced brand name, the Hiddenite Arts & Heritage Center, in May 2015. With eyes firmly fixed on the future, the Center has embraced a renewed vision, an impactful mission, clear values, and a determination to offer new and innovative arts programming. 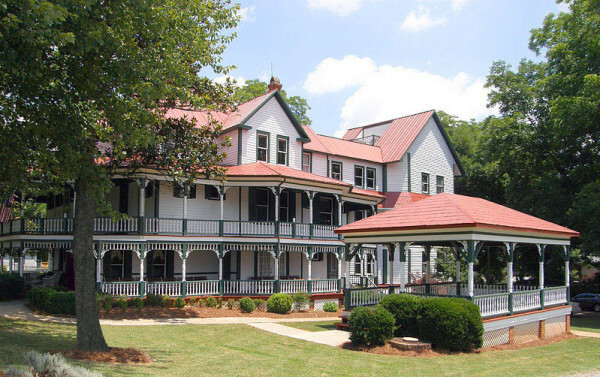 The Hiddenite Arts & Heritage Center is housed within the Historic James Paul Lucas Mansion, a three story Victorian/Edwardian home, which is the only site in Alexander County listed on the National Register of Historic Places. The mansion’s namesake, James Paul Lucas, known affectionately as “Diamond Jim,” was a visionary thinker and doer who made his living traveling the world as a diamond and gem trader. Click here to learn more about Diamond Jim Lucas and the history of the Lucas Mansion. The Lucas Mansion features an art gallery with rotating monthly exhibits, a turn of the 20th century history museum, collections of gems and minerals, and an extensive collection of antique dolls and toys. The Lucas Mansion also houses the Alexander County Visitor Center, which offers local and regional travel and tourism information. The Hiddenite Arts & Heritage Center also operates an Educational Complex, which is conveniently located just down the street from the Lucas Mansion. The Center’s Educational Complex serves as a venue for performing arts events, offers classroom space for visual and performing arts, is equipped with a complete pottery studio, and contains dormitory space for visiting artists in residence. The Center’s Lucas Mansion and Educational Complex are wheelchair accessible. Click here to learn about renting the Educational Complex for meetings and gatherings. Hiddenite Arts & Heritage Center events, exhibits, and programs are made possible in part through the generous funding of Alexander County government, the Town of Taylorsville, the Eileen and R. Y. Sharpe Family Foundation, The Winston Salem Foundation, Duke Energy, the Catawba Valley Community Foundation, the Friends of the Hiddenite Center membership program, and by the N.C. Arts Council, a division of the NC Department of Natural and Cultural Resources. Click here to learn more about our partners in the arts. The Vision of the Hiddenite Arts & Heritage Center is to serve as a catalyst for economic development and tourism, supporting and uniting artists and craftspeople across regional northwest NC communities. The Mission of the Hiddenite Arts & Heritage Center is to serve and promote the talented local and regional artists and craftspeople at The Lucas Mansion and the Educational Complex. The Center endeavors to connect the public with the rich arts and cultural and natural heritage of the northwest NC region by making quality arts and heritage programming accessible for all. Additionally, the Center will build upon its role as the Alexander County Visitor Center highlighting the many qualities of Alexander County. The Center will also strive to improve its offerings at the Educational Complex including performing arts, visual arts, literary arts, pottery and quilting. The Hiddenite Arts & Heritage Center values are cultural inclusion, accessibility for all, mutual respect, creativity in all endeavors, self-expression, regional heritage and continuous learning for people of all ages and backgrounds.